As an entrepreneur, you’re busy thinking about where that next client will come from and what your next big move will be. So, when an opportunity arises that seems as like it may only be of benefit to you, it’s sometimes difficult to seize upon it. After all, your time is precious and it’s your business’s well-being that matters most. But what if there were something like Irma Cedeno’s Diáfano Method? Currently, this program provides businesses in the New York City area with Spanish language and culture competence courses. And the big business benefits to come out of this? Well, they may surprise you. At first glance, you might think the Diáfano Method is no different than any Spanish language course offered at a local college. Despite Cedeno’s background as a professor, that’s really where the similarities end. Her goal in starting this company was to help businesses grow by bringing Spanish language and culture immersion right to their doorstep. According to Cedeno, there are over 40 million native Spanish speakers in the United States, which is more than the number of Spanish speakers in Spain. In addition, the Spanish market in the U.S. continues to increase in value, with a projected consumer spend of $1.7 trillion this year. For entrepreneurs wanting to tap into this growing market, investing in Spanish language and culture classes like the ones offered by Cedeno is a fantastic place to start. A solopreneur could use the skills and knowledge acquired from these courses to demonstrate their respect for a potential clients’ native language and culture. Consequently, this may also result in giving them an edge over the competition. Larger companies could use these language and culture classes as a company perk. By providing employees with a diversion from the corporate world while also giving them a chance to acquire a new and useful skill (for free), businesses can do a better job at retaining employees in the long term. 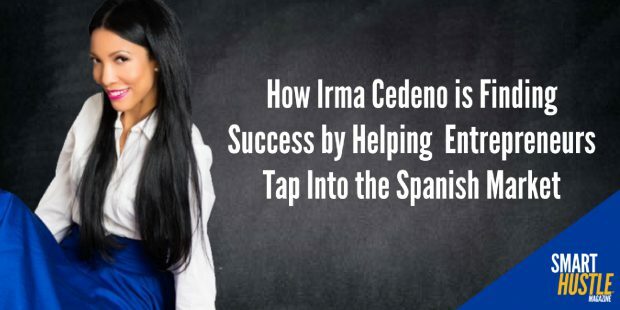 How Irma Cedeno is helping #entrepreneurs reach the #Spanish #market with @diafanomethod. “I always provide a service that I feel gives them a lot more benefits than they’re paying for.” Part of this is due to Cedeno’s dedication to perfection. Part of this is because she truly believes in her company’s mission and wants to give entrepreneurs an opportunity to grow their businesses by utilizing a highly valuable and easily acquirable skill. One of those books she’s found to be incredibly helpful is Think and Grow Rich. Of the lessons she was able to glean from the book, it was the suggestion that you need a mastermind group in order to succeed. And it’s had a lasting impact on her business. “I always rely on people who know more than I know about certain things, and those are the people who have helped me throughout this process,” she explained. No matter how much the inner perfectionist in her would like to hold tight to the reins of her business, Cedeno understands that delegation is the key to her business’s long-term success. It’s also what’s enabled her to start thinking about the future of her company. “We definitely want to create a learning software,” she said, hinting at taking her current B2B business model to a B2C market. She also briefly touched on the idea of turning the Diáfano Method into a franchise, which would be awesome to see since I’m sure there are plenty of businesses outside NYC that would love to start reaping the benefits of her program.